The Lady Tigers softball team wasn’t about to let Branson steal its late-inning thunder. After taking the lead in the bottom of the sixth, Republic gave up the tying run to Branson in the 7th, but responded by scoring the game-winner on a bases-loaded single by Livi Collier in their final at-bat. Collier’s hit delivered a 4-3 conference win over the Lady Pirates and kept Republic undefeated at 5-0. The Lady Tigers have come from behind in four of their five victories. 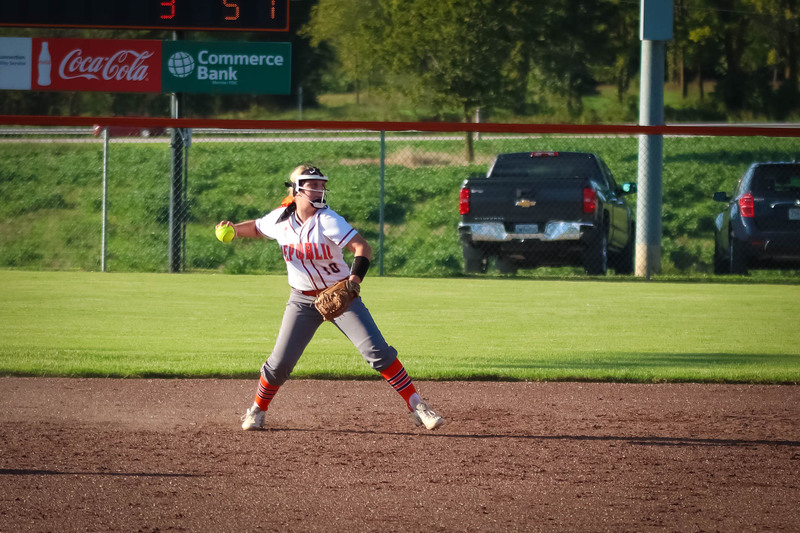 Avery Romans struggled in the pitching circle in the first inning, as she has in previous games, but turned it around to give Republic a chance to claw its way back. Branson scored three in the first, but the Lady Tigers immediately started chipping away at the lead. Republic scored one run in the bottom of the first when Kaitlyn Ragsdale singled and scored on a groundout by Julia Higgins. In the bottom of the third, Higgins doubled home Emma White and Megan Weis to make the score 3-3. Higgins scored the go-ahead run in the bottom of the sixth, scampering home from first on a double by Collier. After Branson tied the game in the top of the seventh, Riley Laub singled to lead off the bottom of the inning and advanced to third. Branson intentionally walked Ragsdale and Weis to load the bases. Higgins fouled out, but Collier singled to left field, driving home Laub with the game-winner. Higgins had two hits and three RBIs. Collier had two hits and two RBIs. Romans had two hits as well, in addition to being the winning pitcher. She pitched seven innings, allowing four runs on nine hits, striking out three and walking one. Despite its 5-0 record, Republic has been outscored 11-4 in the first innings of its games. The Lady Tigers have allowed just ten runs in all the other innings combined, and have outscored opponents 42-10 in those innings.